Moscow has called on the international community to put pressure on Ukrainian authorities, which are not making any ‘tangible steps’ towards an independent and impartial investigation of last year’s Odessa massacre, Russia’s Foreign Ministry said. “With a deep concern we have to state that one year [since the tragedy], the Ukrainian justice system did not take any tangible steps toward an objective, independent and impartial investigation of this horrific crime in order to bring the perpetrators to justice,” the statement by the Russian Foreign Ministry said, as cited by Sputnik news agency. 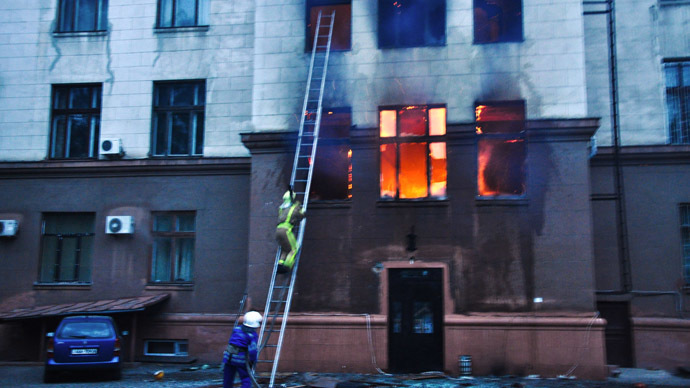 On May 2 last year, the Ukrainian radicals set fire to the Trade Union House in Odessa, killing 48 and injuring over 200 anti-Kiev activists inside. “As a result of these barbaric acts of intimidation, several dozen people, whose only fault was that they openly expressed their civic stance against the anti-constitutional coup in February 2014 and outburst of radical ultranationalists, were killed,” the Foreign Ministry’s statement reads. Moscow urged the international community, including human rights NGOs, to “decisively and honestly” demand Kiev stage a fair investigation into the Odessa massacre and correct the “glaring flaws” in Ukrainian judicial system. The ministry stressed that Kiev’s “carelessness” and passiveness in investigating the May 2 events is backed by the stance of its Western backers and some major global media outlets. The little attention given to the Odessa massacre in European and American news is “yet another manifestation of information warfare and manipulation of the media,” the statement said. Meanwhile, the US also addressed Kiev with an appeal not to delay the investigation of deadly fire. “We reiterate the need for a thorough and transparent investigation so those responsible can ultimately be held accountable. We continue to urge the Ukrainian government to investigate and bring charges against those culpable for the events in Odessa and to do so as quickly as possible,” Marie Harf, US State Department spokeswoman, said on Thursday. On April 30, the Council of Europe (CE) announced that its International Consultative Group will arrive in Ukraine in early June to assist in the investigation of last year’s tragedy in Odessa. The CE representatives will meet with authorities in Kiev and Odessa, which may lead to the creation of a new official list of questions to Ukraine’s prosecutors. 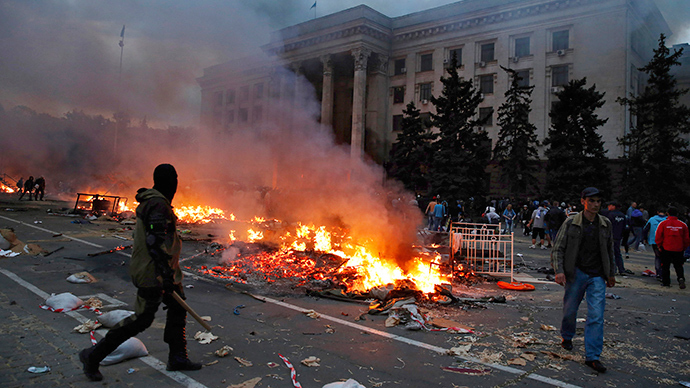 The Council of Europe expects that the report on the investigation of the Odessa massacre will be ready in fall. On May 2, 2014, the activists, who refused to recognize the coup imposed government in Kiev, clashed with pro-Ukrainian football fan and radicals, including Right Sector nationalists. The inaction by the police allowed the radicals to trap the anti-Kiev protestors inside the Trade Union House, which was set on fire by Molotov cocktails. The people had little chance to save themselves and extinguish the flames as fire hoses in the building were out of order. Some of the victims burned to death, while others suffocated from smoke or jumped out of the building's windows. Many of those who did jump out were strangled or beaten with bats by the attackers. Another 40 people were injured, including 10 police officers, in a shocking incident that received little coverage in the Western media. There were plenty of riot police in the vicinity, but rather than helping, they stood by and watched the violence unfold.